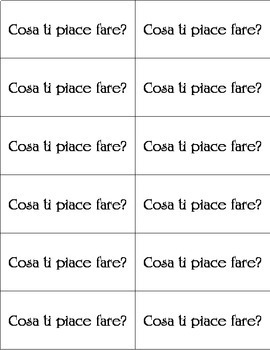 Do your students need to practice informal discourse using the introductory expressions in Italian? 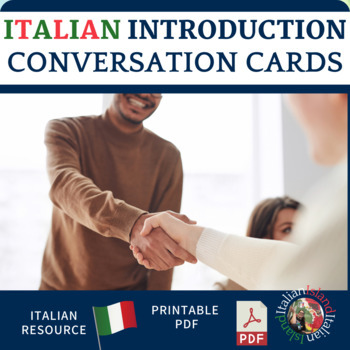 Use Italian Introductory Vocabulary Conversation Cards to allow your students to do just that. File includes 3 ideas for use, student instruction sheet, and 12 pages of cards. Each page has 12 of the same card. Print only the pages you want to use! 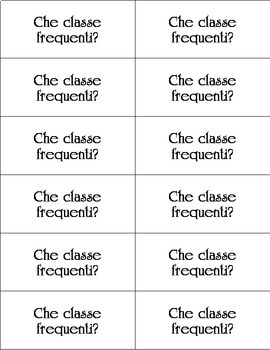 Vocabulary includes: hello & goodbye .asking name, asking age, asking where from, asking school attended,asking what one likes to do, asking grade attendefd, asking how one feels, asking where one lives,asking how to spell, and asking for phone number.